Today is brew day! Even though there is no boil involved in making this hard cider I am in the process of boiling wort for another beer as I write this. This cider is kind of an experimentation as I came up with the recipe on my own and am just kind of figuring it out as I go. 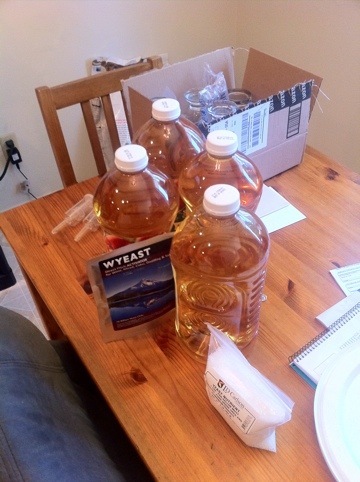 Started with 5 gallons of apple juice with no preservatives because the sorbate will kill the yeast and there will be no fermentation. After fermentation is done I’ll transfer it to a secondary and add potassium sorbate to kill the yeast so I don’t have a 2nd fermentation this should keep the finished product from being too dry. I want to keep the fruit flavors and sugars intact. Then I’ll add 4-6 lbs of mixed berry frozen bags to the secondary and let it rest for probably 2 months to blend. Should be perfect cider to mix with hef and something Nicole can enjoy on it’s own! ~ by B. Rogers on April 28, 2012. When I first began learning about how to make wine at home, I had the mistaken impression that potassium sorbate killed yeast. This is what some of the literature says or implies. However, this is simply not true. What it does do is inhibit yeast reproduction. Thanks for the info I was having a hard time finding any real info on what potassium sorbate did exactly. Luckily the yeast strain that I chose didn’t finish very dry so I didnt really need the sorbate. I used it after it was finished and then gave it another couple days in the primary and then racked it. 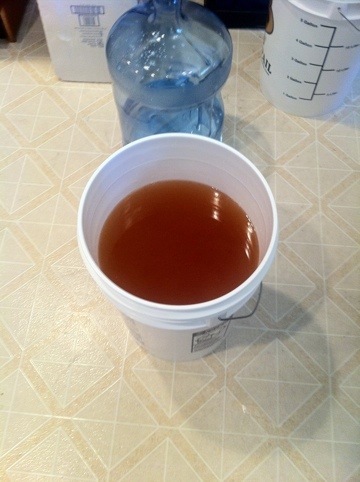 Hoping it will help settle most of the yeast out in the secondary and then I will back sweeten before kegging a little. I figured also that I could just cold crash in my kegerator because its plenty big enough but I wanted something that I I didnt need to make room in the kegerator for.